As a woman approaches menopause, she is susceptible to lapses in memory, also known as brain fogs. This is due to a decline of estrogen levels in the body, affecting production of the neurotransmitters that drive the brain's cognitive functions. Unlike memory diseases such as dementia, menopausal memory lapses are not necessarily definable through specific tests. Testing for this symptom is possible, but it is a process that requires self-analysis, potentially with the input of those close to you. Can You Recall Information at Will? Memory issues during menopause are usually short-term ones. When you receive new information or instructions, do you find yourself immediately forgetting what you've just been told? Do you struggle to adapt to changes in routine? Inability to absorb and recall new information is the primary symptom of menopausal memory loss. Women with memory issues during menopause often experience difficulty concentrating on tasks that require thought and effort, but are not necessarily difficult. Common symptoms include struggling to concentrate while reading, paying attention to the plot of a film, or concentrating on an engaging activity, such as a game of cards or a crossword puzzle. Do You Forget Recent Events? 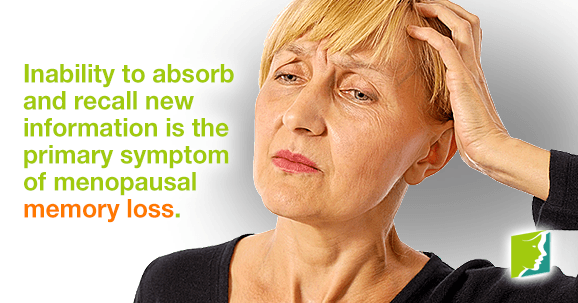 It is common for women suffering from brain fogs during menopause to momentarily forget a very recent event or action but then be able to recall it at a later date. For example, you may find yourself standing in a room of your house without recollection of the motivation or event that brought you there, but you are able to recall the reason ten minutes later. Are Your Thoughts Ever “Fuzzy”? Do you find your thoughts becoming easily muddled? Fuzziness is more of a feeling of general inability to order thoughts in your mind than something that is specifically identifiable. It is a sense of lack of sharpness, a combination of difficulty concentrating, recalling information, and forgetfulness. Has Your Family Expressed Frustration? It can be easy to dismiss examples of memory lapses as nothing unusual, but if your family is frustrated at having to repeat information to you or they express concern, it is likely that you are experiencing brain fogs brought on by menopause rather than the occasional memory lapses that everyone experiences. Unlike the physical symptoms of menopause, memory lapses are difficult to identify as they are normally characterized by a general feeling of loss of sharpness rather than specific incidents. Like other skills, memory is a function that can be improved with a series of lifestyle adjustments, regular exercise, and specific concentration techniques. However, if you are concerned about your memory, consult your doctor about your options, which may include taking a blood test to measure hormone levels or rule out more serious health concerns. Can Sudoku Prevent your Memory Lapses? There’s nothing wrong with enjoying the odd alcoholic drink, but excessive alcohol intake can damage cognitive functions.